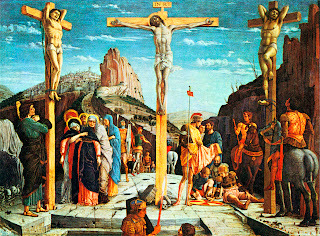 Most people who read the narratives of Christ’s passion and death in the Gospels—especially those who read them today as part of Good Friday services—will note that they are simply saturated with allusions to the Old Testament. Catholics who listen carefully to the Responsorial Psalm read right before the Gospel reading, will especially hear allusions to the psalms when it comes time to hear the account of the passion. What’s going on here? Why the references to the psalms? Why are they so important to the Gospel writers as they record Jesus’ final hours? The importance of the allusions to the psalms in the passion narrative should not be overlooked. Time and time again, the Gospel writers describe Jesus’ suffering by alluding first and foremost—not to Isaiah, Daniel, or any of the other prophets—but to the psalms. In fact, a major monograph on the subject was recently published by Cambridge University Press: Stephen P. Ahearne-Kroll’s, The Psalms of Lament in Mark's Passion: Jesus' Davidic Suffering (2007). I would even go so far as to say this: one cannot really fully understand the passion narratives—at least, one cannot fully appreciate what the Gospel writers are trying to communicate—without paying close attention to the role of the psalms. Here I want to work out some of the issues involved and their implications. First, as the title of the book by Ahearne-Kroll’s alluded to above suggests, Jesus’ suffering was clearly understood as relating to his role as the Davidic Messiah. By the way—shameless plug alert!—for more on Jesus’ role as the Davidic Messiah, see this two-part post (Part 1, Part 2) on Matthew’s Davidic Christology. Although these posts are specifically focused on Matthew’s Gospel, many of the points apply to Mark and Luke as well. But why is Jesus’ suffering linked to his Davidic role? For many the connection is elusive, primarily because the life of David is obscure. Sadly, many simply do not read the life of David. When most people think of David, they don’t think of a “suffering servant”. 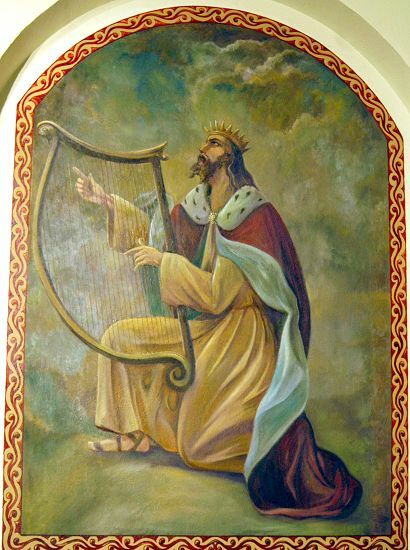 For many, I suspect, David is memorable for four things: (1) killing Goliath as a youth; (2) becoming a king; (3) committing adultery and seeing to it that the husband of the woman he slept with was killed; and (4) writing Psalms (or at least, playing some sort of harp!). To put it rather baldly, to many Christians David is sort of the “Elvis Presley” of ancient Israel: he was the man who became king, did ugly things, and wrote all the “hits”. But such a view is really a caricature; it does not do justice to the complexity of the portrait of David in Scripture. For one thing, it overlooks the motif of suffering in David’s life. Yet, on this Good Friday, what is striking to note is how similar the accounts of David's suffering are to the passion narratives of the Gospels. The similarities between David’s sufferings and Jesus’ are so great scholars will even sometimes speak of the “passion of David”. 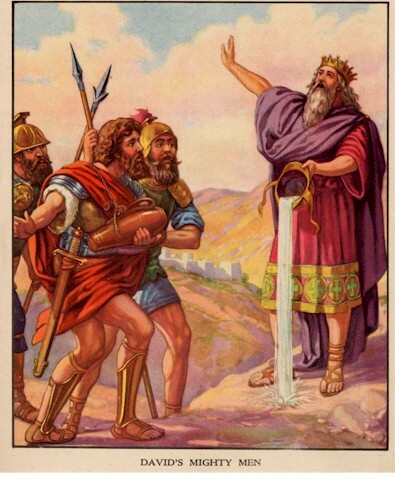 One story in particular that should be mentioned is the betrayal of David during the attempted coup of Absalom. Absalom, David’s son, tried to usurp the kingdom from his father. He thought he had an ace in the hole—Ahithophel,who was one of David’s closest confidants. Ahithophel was in Absalom's corner. And all the country wept aloud as all the people passed by, and the king crossed the brook Kidron, and all the people passed on toward the wilderness. But David went up the ascent of the Mount of Olives, weeping as he went, barefoot and with his head covered; and all the people who were with him covered their heads, and they went up, weeping as they went. . . And it was told David, “Ahith'ophel is among the conspirators with Ab'salom.” (2 Samuel 15:23, 31). Like Jesus, David goes to the Mount of Olives, crossing the Kidron: "And when they had sung a hymn, they went out to the Mount of Olives" (Matt 26:30). John also tells us: "When Jesus had spoken these words, he went forth with his disciples across the Kidron valley, where there was a garden. . ." (John 18:1). Both discover they have been betrayed by a close friend in the vicinity of the Mount of Olives. In fact, the fate of both Ahithophel and Judas are also strikingly similar. Judas hangs himself (Matt 27:3–5). Likewise, after he realized the coup failed, we read: “. . . Ahithophel set his house in order, and hanged himself” (2 Sam 17:23). Yet, more than any of the other scriptures of Israel, when the evangelists describe the sufferings of Jesus it is the Book of Psalms that takes center stage. Insults have broken my heart, so that I am in despair. I looked for pity, but there was none; and for comforters, but I found none. ﻿21﻿ They gave me poison for food, and for my thirst they gave me vinegar to drink. (Ps 69:20–21). 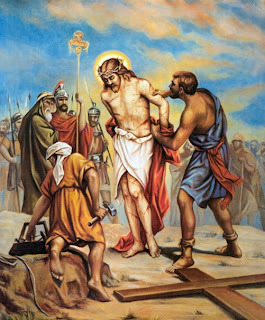 Likewise, we read: “And when they had crucified him, they divided his garments among them by casting lots. . .” (Matt 27:35). The allusion here seems to be to Psalm 22: “they divide my garments among them, and for my raiment they cast lots” (Ps 22:18). Moreover, we read, “And those who passed by derided him, wagging their heads . . .” (Matt 27:39). Here we see an allusion to Psalm 109: “I am an object of scorn to my accusers; when they see me, they wag their heads.” (Ps 109:25). 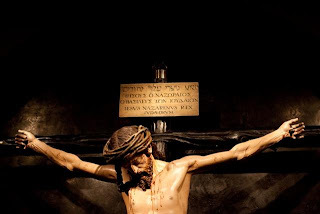 Finally, Jesus’ suffering concludes with him specifically citing the first verse of Psalm 22: “My God, my God, why hast thou forsaken me?” The Psalm of course goes on to explain, “. . . they have pierced my hands and feet . . . ” (Ps 22:16). Of course, given that Jesus was remembered for being nailed to a cross, this line would have clearly been also easily applied to Christ. I might add here a reference to Mark Goodacre's excellent podcast on the question of whether or not the accounts of the passion are "Prophecy Historicized", that is, prophecy retold as if it were history. 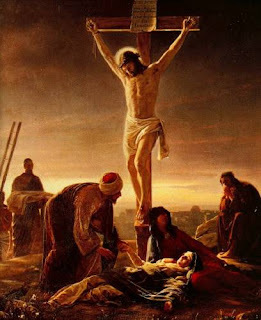 For some scholars, particularly, John Dominic Crossan, these connections are evidence against the historicity of the passion narrative--i.e., some claim the evangelists simply made up the story of Jesus' death by pulling together passages from the psalms and prophets. Goodacre explains why this argument doesn't hold up. What’s the significance of all of this though? I’d like to suggest that the answer relates to a motif that is central to the passion narrative: that Jesus’ suffering is closely linked to his role as the Davidic Messiah. Put another way, the cross is the revelation of his kingship. Of course, that would seem to be a hard sell to ancient Jews. The King must die? 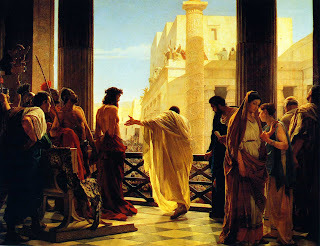 The thought of the Christ suffering was clearly difficult for Peter to accept: ““God forbid, Lord! This shall never happen to you” (Matt 16:22). How could the King be betrayed and suffer? The answer the evangelists forward would seem to be: the same way David was. As Ahearne-Kroll observes, the psalms—particularly those alluded to in passion narrative—were closely tied to David. The superscriptions for Psalms 22, 69, 109 all attribute them to David. Indeed, in ancient Judaism David was closely associated with the psalms. In sum, to those who would argue that Jesus’ death was somehow evidence against his Messiahship, the evangelists it seems underscore the point that if suffering and kingship are antithetical then David himself could not have been king. ﻿17﻿ And they clothed him in a purple cloak, and plaiting a crown of thorns they put it on him. ﻿18﻿ And they began to salute him, “Hail, King of the Jews!” ﻿19﻿ And they struck his head with a reed, and spat upon him, and they knelt down in homage to him. ﻿20﻿ And when they had mocked him, they stripped him of the purple cloak, and put his own clothes on him. And they led him out to crucify him. (Matt 27:15–20). Likewise, all four Gospel writers record that Pilate had a sign placed over Jesus’ head on the cross, identifying him as the “king of the Jews”. Jesus’ kingship is revealed on the cross. In fact, another way this is highlighted is in the crowd's choice of Barabbas. The crowd's choice a political leader, not a suffering Messiah. (For more on that, see this post). In closing, let me attempt to tie two passages together which seem intended to be read in light of each other. According to both Matthew and Mark, prior to arriving in Jerusalem James and John (or James and John through their mother) ask Jesus to be seated in the places of honor in the kingdom. The language is important: Matthew tells us that the mother of James and John ask: “Command that these two sons of mine may sit, one at your right hand and one at your left, in your kingdom” (Matt 20:21). 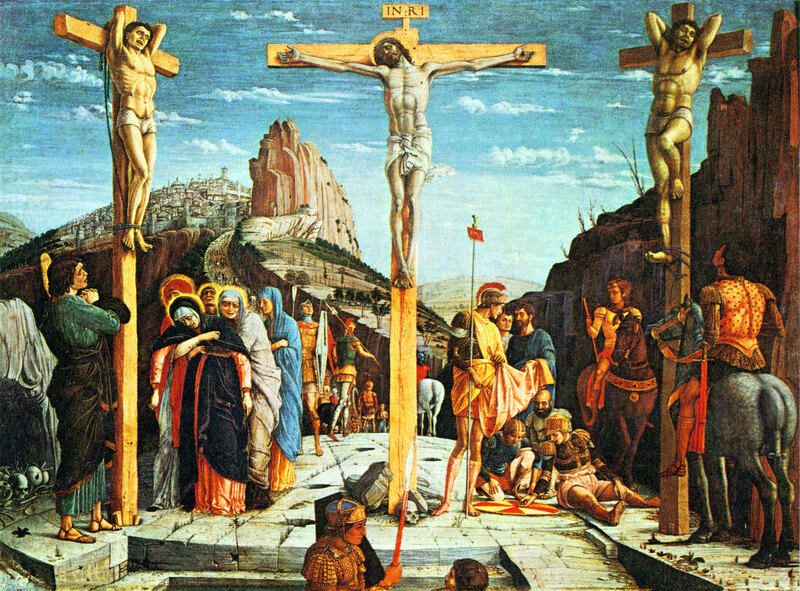 Then two robbers were crucified with him, one on the right and one on the left. . . 55 There were also many women there, looking on from afar, who had followed Jesus from Galilee, ministering to him; 56 among whom were Mary Magdalene, and Mary the mother of James and Joseph, and the mother of the sons of Zebedee. (Matt 27:38, 55–56). The two at Jesus’ right and left when he “came into his kingdom” were the thieves—because the cross is the coming of his kingdom. And note that Matthew tells us that the mother of James and John was looking on at the scene—in a sense, she witnessed what it was she was asking for her sons. Suffering may seem antithetical to Messiahship—i.e., to God’s plan of salvation—but that’s only from a worldly perspective. The point of tying Jesus’ suffering to David’s seems to be that suffering does not exclude kingship—rather, the true king suffers. “For the word of the cross is folly to those who are perishing, but to us who are being saved it is the power of God.” . . . 25 For the foolishness of God is wiser than men, and the weakness of God is stronger than men. (1 Cor 1:18, 25). 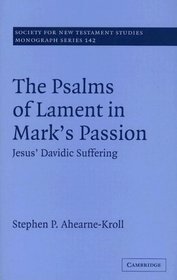 See Stephen P. Ahearne-Kroll, The Psalms of Lament in Mark's Passion: Jesus' Davidic Suffering (SNTSMS 142; Cambridge: CUP, 2007). A connection between these two passages is rightly noted by numerous commentators. See, e.g., John Muddiman, “The Glory of Jesus, Mark 10:37,” in The Glory of Christ in the New Testament: Studies in Christology in Memory of George Bradford Caird (eds. L. D. Hurst and N.T. Wright; Oxford: Oxford University Press, 1987), 57: “The only other place in Mark’s Gospel where the right and left hand places next to Jesus are mentioned is 15:27, the Crucifixion scene. Whether or not we read the appeal to fulfillment of Scripture at 15:28, the whole section already bristles with elements of prophecy-fulfillment in regard to the soldiers’ actions and also to the motif of the kingship of Jesus, paradoxically revealed in suffering.” Likewise, France (Gospel of Matthew, 1068) writes, “Another ironic note, for those who remember the request of James and John through their mother in 20:20–21, is to see who it is who in fact occupy the place at Jesus’ right and left in his ‘kingship,’ while James and John themselves are nowhere to be seen.” Davies and Allison (Matthew, 3:615) also explain that “. . . being at his right and left, [the two thieves] are where James and John professedly wanted to be (20.20–23).” See also Nolland, Matthew, 1194; France, Mark, 646; Keener, Matthew, 486; Luz, Matthäus, 3:160–61. Such profound ties between the Old and New Testaments here. The more we can bring the OT and NT together, the more Salvation History will be revealed to us as a common thread rather than a series of vaguely connected stories. Thank you!